I have a very quick and simple solution that only costs pennies to clean your produce. If you have ever witnessed a fellow shopper sneeze or cough while shopping for produce without even trying to stop to use hand sanitzer all the while continuing to touch EVERY piece of produce, you've probably wondered if every piece of produce you buy is covered in germs, let alone all the pesticides and wax they use to make sure they look pretty. Rinsing them in water alone won't always do a great job of washing away what's on the produce. There are commercial brands of fruit & veggie washes at the stores, but for mere pennies you can mix your own up. It's important to wash all produce, even melons, avocado's etc. because in cutting through the unwashed rinds, you may transfer "icky's" to the inside edible parts. I recommend two versions: Spray Bottle and Soak methods. I prefer using the soak method for softer skinned tiny fruits/veggies such as grapes, strawberries, blue berries, etc. as well as my apples. The soak method helps strip off the store wax (if you want it off, it's personal preference) a bit better. 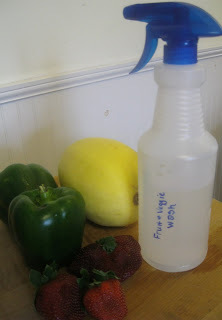 The spray method perfect for harder skinned fruits/veggies is great in it's easy and quickness of use. I love to spritz over all my peppers, green onions, radishes, celery, etc. then rinse and store. Apples too, are great for this especially if you are short on time for the longer soak method. 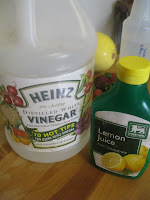 Both recipes use the same ingredients, just in slightly different proportions: water, vinegar and lemon juice. This works better than plain water because the acid in the vinegar and lemon juice help to kill any bacteria, as well as strip the wax and pesticides off of the produce. Gently shake to mix. Store in refrigerator between uses. To use: Spray produce, let it sit for 1-2 minutes, then rinse well. Soak fruits/veggies for at least a 2-5 minutes. Remove from soak and rinse well. When washing, pay particular attention to the stem areas of fruits where it is easier for dirt and pesticides to accumulate. Leafy Greens require approximately 2 minutes of Soaking for best results- you'll notice that this makes your greens more crisp and fresh tasting as well!